I suppose rightfully, we have not yet heard from the bank bigwigs who have in recent days watched their institutions go under. As the crisis blows by, surely there will be mountainous testimony through books, movies, talk shows, etc. But it’s my guess that these folks are suffering right now. I generally discredit conspiracy theories and don’t believe any few individuals have the smarts it would take to commandeer the market for any length of time. It’s my guess that these executives (for the most part) worked hard and long at their jobs, and did their best to follow the dictates of their boards and the market. I’m suggesting that these culprits bear no more responsibility than every American. There was inherent failure in the subprime mortgage from the start; since when does inability to understand the fine print excuse the individual from liability? It was our sense of entitlement, our greed that allowed us to grab the high life even though we could ill afford it. The banks offered, and we blithely accepted. Was the snake more culpable than Eve? So the universal attitude that the government should help the individual homeowner rather than the banks just doesn’t hold water. We are the ones who predicated this mess, all of us; it was not the banks alone. To cop righteous indignation and seize the chance to cry ‘poor me’ is ignorant and small minded in the extreme. Per previous posts, the reader will know I’m hardly in support of massive bailouts, either. If we allow the truth to prevail, we know that allowing the market to right itself is the American way. But we’ve carried our excesses so far that it’s unlikely we’ll align with highest truths in this situation. We are nowhere near resilient anymore, and just can’t stomach the prospect of a really serious economic downturn. So we’ll rescue the banks and carry on as usual. Until the next time we run up against our collective selfishness and feel the need to desperately point fingers. PS: I have a parallel thought to this financial fiasco: does it not reflect the same kind of mess we’re in with health care? Who will bear the brunt when insurance goes bust? When will the cost of medical attention break this country’s back? The tax called health care insurance is already too burdensome for many: does this not suggest that defaults will increase and the insurance giants who gamble for our blind loyalty are riding for a fall? The market is failing, paranoia runs rampant, everyone’s worried and on the defense. 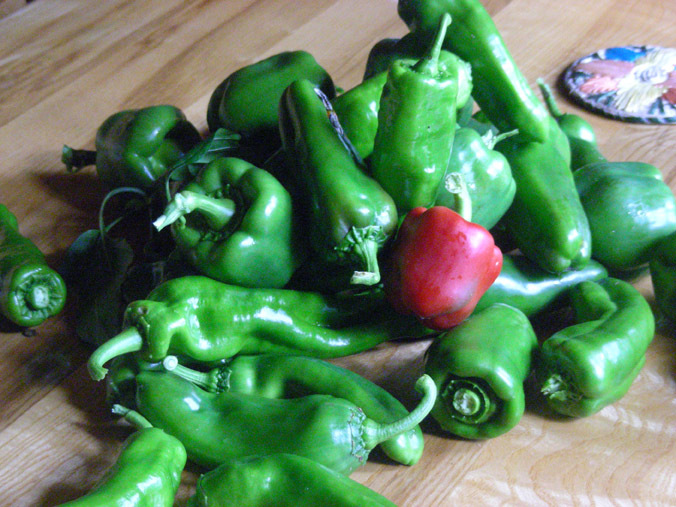 Greenbacks are scare, but green peppers are in abundance this year. When life hands you the wrong kind of green, make salsa! Oh brother, we’re worried now. There’s no more denying it. Banks closing and stocks plunging indicate more than a harmless economic slump. The events of this week (so far) are enough to cause mild panic, as in, gee maybe I should get my greenbacks back under my mattress. Certainly businesses are forced now to consider alternative approaches to marketing, and even survival. My networking group yesterday was full of concern at the slowdown. The same old PR tactics just aren’t turning up the clients anymore. From the long view, the scare is an excellent opportunity for growth. We can shake off the dribble and dross of clever marketing, and return to the core value of what we are doing. Do you believe your product or service is useful, helpful, a boon to humanity? (It should be, and if it isn’t, perhaps you’ll want to look at doing something different.) When sales are no longer produced by fancy tactics with clients dying to spend money, we can with relief return to the essential, real-life, direct convenience or comfort of the thing we produce. We can work on improving it. We can customize it to answer to real needs. In short, we can ignore the selling and concentrate on the creativity. This is the time to remember that money is a measure, not an end in itself. The ultimate reason for your product or service is to assist your fellow man/woman, to increase the quality of life. Now’s the moment to return to that core meaning of your work, to tweak it so that it performs to perfection; and even to extend its virtues to new applications, to dream of yet uninvented solutions. In other words, to use this helplessness in the face of a failing national economy to return to essentials and thereby rediscover the true worth of our commerce. We’re ready for a summer holiday. We need an innocent break from worries of recession. A couple of days away from the oppression of oil tycoons and Dow Chemical will do us all a load of good. We’ll flip a few burgers on the grill and spend time with the kids. We’ll soak in some sunshine and try not to think too much about the intesifying glare of international disdain that threatens the pre-eminence of America. Make no mistake, our country is headed for major life changes. Perhaps we’re on the verge of our twenties, escaping at last from the swash and buckle of teendom. Perhaps we’re maturing into the responsibilities of adulthood, where nothing is certain and our accustomed pride implodes. In our own business lives, when we grow past the startup and begin to look at how to establish long term sustainability, do we do so in the old way, with aggression, bravado, and competition? Do we seek to establish ourselves as the one with all the toys, do we respect only those who evidence gigantic material gain? Do we apply all the recommended tricks to trap wealth and in the process let our souls shrivel from neglect? The deep, loving, intense, devoted, dedicated cultivation of soul has been missing in our culture. So now, the current requirements for growth have everything to do with soulful revitalization. Establishing sustainability in your business is about incorporating soul needs – yours especially, and also those of your customers. It may seem impossible, but actually only requires a little creative practice. Learning to integrate your inner being with your business structures and offerings will be the most satisfying accomplishment of your life. Taking advantage of global awareness, our maturation as a nation has everything to do with developing reverence for soul, just as the maturation of places like India and Africa has everything to do with integrating practicalities into what has previously been dominated by eternal mysteries. As you bask in sunny Independence Day frivolities, consider how you can carry some of the whispers of soul that permeate the holiday back with you when you return to work.